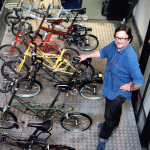 To mark the Golden Jubilee of their iconic bicycle, Moulton present the Moulton Jubilee - small 20” wheels and full suspension for the longest or shortest of rides, on the smoothest or roughest of roads. There are 3 Jubilee’s to choose from: Campagnolo Potenza, Shimano Alfne or Shimano 105 all 20” wheel size and separable via the removal of Kingpin. The Campagnolo option comes with a drop bar (44 or 42) Alfne option with fat bar and Shimano with either a drop/fat bar. AL35 stem or optional Wishbone. Choose from red, white or blue. 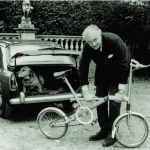 In 1962, Alex Moulton unveiled his revolutionary small-wheeled, full suspension bicycle. 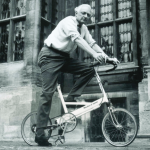 Fifty years and millions of rider miles later, we remain true to the original Moulton principles of small wheels and full suspension for comfort and speed. To mark the Golden Jubilee of our iconic bicycle, we are proud to present the new Moulton Jubilee - small 20” wheels and full suspension for the longest or shortest of rides, on the smoothest or roughest of roads.